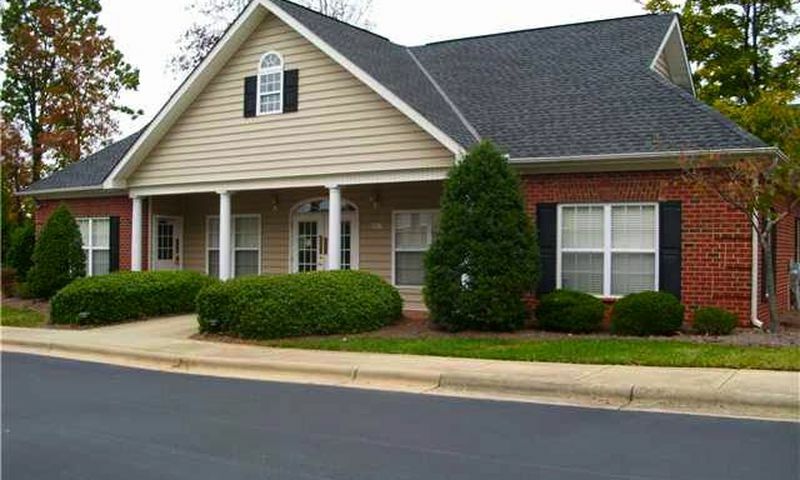 Guilford Crossing is a 55+ community located in Greensboro, North Carolina. This condominium community offers many indoor and outdoor amenities that appeal to active adults. Guilford Crossing was developed in 2001 and completed in 2002. The community consists of 48 condos that were designed for a maintenance-free lifestyle. Residents of Guilford Crossing have full access to the community clubhouse. Here you can enjoy the company of friends and family in the relaxing lounge, meet with clubs in the multi-purpose room, or grab a cup of tea in the kitchen. Guilford Crossing also provides amenities to keep you fit and active. You can work on your strength training in the fitness room or enjoy cardio on the walking path that breezes through a garden and outdoor patio area. Guilford Crossing consists of three condo buildings that contain a total of 48 modern units. These three-story buildings provide elevator access to all levels and parking within an adjacent parking lot. Guilford Crossing has many trees along the community’s edge to provide scenic views and a sense of privacy. Two floor plans vary in size from 1,225 to 1,483 square feet. They offer two large bedrooms, two bathrooms, and a den. These wonderful condos have arched doorways, gas fireplaces, and well-lit dining areas. Guilford Crossing is one of the few active adult condo communities in Greensboro that has a 55 and better age-restriction. Guilford Crossing’s clubhouse is the central hub where residents plan fun neighborhood events and activities. Clubs and interest groups also meet at the clubhouse to play cards, host book discussions, and enjoy common hobbies. Residents can enjoy the outdoors at the clubhouse patio and barbeque area with life-long friends, take brisk walks or jogs on the walking paths, or read by the picturesque garden. Guilford Crossing is located in Greensboro, North Carolina central to three major roadways: Friendly Avenue, New Garden Road, and Market Street. The community is conveniently located near many shopping opportunities at The Shoppes at Friendly, Quaker Village Shopping Center, and Wendover Avenue shopping. Golf enthusiasts can tee up at the Starmount Forest Golf Course. Harris Teeter and The Fresh Market are also near Guilford Crossing for all of your grocery needs. Residents of Guilford Crossing enjoy access to public transportation making travel a breeze throughout Central North Carolina. This active adult community in Guilford County, NC is perfect for today's homebuyers looking for a low-maintenance condo unit. Check back soon for more information on the lifestyle in Guilford Crossing. There are 48 condo units in Guilford Crossing. Elegant attention has been given to the architectural design of each condo unit. These residences offer nine-foot ceilings, gas fireplaces, and elevator access to all levels. Parking is provided by a parking lot located adjacent to the building. Looking for a home with no worries about roof repairs and minding the yard? A place with friendly neighbors that share your interests? Well look no further. Guilford Crossing is a community of 55+ condos that has a secure entrance with access to the second and third floors via an elevator. The condo units are elegantly appointed with 9 feet ceilings and arched doorways. I think you'll like a community where residents can get together in the clubhouse and just socialize or have fun playing cards. If you like to exercise, there is an exercise room with just the equipment you need. If you like to have friends and family over, there is also a full kitchen in the clubhouse and a barbecue grill on the clubhouse patio. Come check out Guilford Crossing! 55places.com is not affiliated with the developer(s) or homeowners association of Guilford Crossing. The information you submit is distributed to a 55places.com Partner Agent, who is a licensed real estate agent. The information regarding Guilford Crossing has not been verified or approved by the developer or homeowners association. Please verify all information prior to purchasing. 55places.com is not responsible for any errors regarding the information displayed on this website.